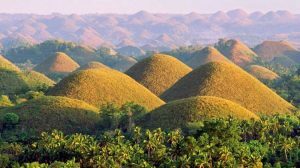 Bohol is bent on making history by getting a Unesco recognition as a geosite, the first for Philippines. Gov. Edgar Chatto, Acting Vice Gov. Venzencio Arcamo, and Third District Rep. Arthur Yap led the symbolic unveiling of the Geomarker at the Chocolate Hills Complex on Sunday to boost Bohol’s application for Unesco declaration of the entire province as a global geological park. Etched on the marker is the “Aspiring Bohol Global Geopark” title with the simplified description of how “a single platform of thick and widespread buildup of coral reefs” evolved into what is now the “uniformly shaped conical isolated hills” called the Chocolate Hills. The United Nations Educational, Scientific and Cultural Organization (UNESCO) is “the same agency that proclaimed the Chocolate Hills a national geological monument and proposed its inclusion in the World Heritage List”, as the Department of Environment and Natural Resources (DENR) puts in its past feature on post-earthquake Bohol. The DENR also explained in its feature that “once declared a Geopark, Bohol will be included in the Global Geoparks Network being supported by the UNESCO”. Delos Reyes, Aguda, and Hillmar authored the book, “Bohol A window to the Philippines’ Natural History Towards Sustainable Island Development”, published in December 2016 where they featured the geosites in the province. The book is also intended to help the Philippines’s application for geopark declaration by Unesco. The book contains a comment from UP President Alfredo Pascual, describing it as “important not only as a corpus of knowledge on Bohol’s natural history, but also as an evidenced-based document which forms part of the submission to, and eventual approbation by Unesco Paris for the establishment of Bohol Island Province as the First National Global Geopark in the Philippines”. Delos Reyes added that Unesco will be coming here in March 2018 for the pre-valuation of a geopark. “This year, there are a lot of applications and they said that if the Philippines will apply, they will be much interested because in the Philippines, there is no geopark yet. So if we apply, it is already approved,” according to Delos Reyes. He also said “the Global Geoparks Network (GGN) will also be holding a meeting in Bohol “to showcase our first and only geopark in the Philippines”, . Chatto, for his part, recognized the authors of the book as the “the brain behind thinking of pushing Bohol to the nomination in Unesco”. “When they approached me at my office, I had so many questions. What will that mean? What efforts we are going to put in place so that we can reach that goal? What will be its impact to Bohol? Will our farmers lose the land and they will be provided with restrictions because we are declared with what we call the Bohol Global Geopark declaration? All my [questions] were clarified and they said there will be no such restrictions, because this will only be an advocacy of preserving what we have,” Chatto said. The advocacy is unique in a sense that it would be for a global recognition, according to Chatto. “When we reach that goal, we hit the record of being the first province to be declared a Unesco geopark in the whole Philippines. The other Unesco-declared areas are only sites. But here in Bohol, uniquely, they convinced me that is the whole province that should be declared a geosite. Not just the Chocolate Hills, not just the Hinagdanan Cave, or the other areas, not just our heritage churches, but the entire province,” Chatto added. He said that he realized how important it would be for the province and make an impact, he suggested that the best time to launch it is on the occasion of the anniversary of the earthquake that happened in 2013” and so the launching was held on October 15. “We had said time and again that the earthquake actually happened to Bohol, but it would also be like saying that ‘when God closes a door, He opens several other windows’. And, indeed, the windows of opportunity for the province of Bohol have been opening up every year. And it has not stopped until now. 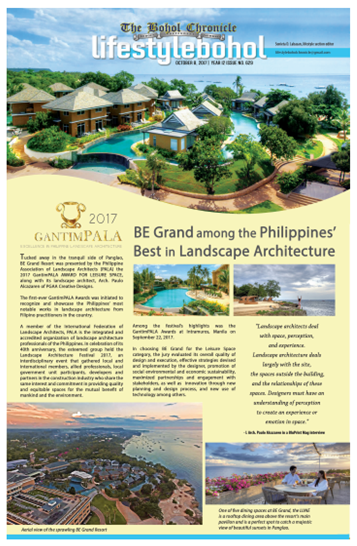 Every year, there are opportunities opened for Bohol simply because we have struggled as one province to stand again after the devastating earthquake,” according to Chatto. He said it will also be enhancing the Boholanos’ desire to keep the province environmentally sustainable in adherence to the principles of sustainable development. The governor also mentioned that on the occasion of the 4th anniversary of the Great Earthquake- -as the magnitude 7.2 earthquake in 2013 has been dubbed- -the province also “opened the new Capitol as the testament and monument of what is called the cultural heritage of the province of Bohol”. “In Tagbilaran, we just opened the old Capitol Building now as the new Bohol National Museum. Next year will be the grand opening where all the exhibits will be there. Now, you will see work going on to put all the exhibits in place but the entire building is already completed,” Chatto said.